Papaitonga, the objective of Wellington's second “Mystery Train” excursion, on Sunday, August 14th, could well be described as quite off the beaten track. It is not visible from the railway line, although within an easy walk of Ohau Station, and it is very little known to Wellington people. Yet its beauty and its romantic history combine to give it an interest of a very special character; and its seclusion from the routes of travel heightens its charm to those who see it for the first time. Access to the place was granted by the kindness of Mrs. Hammond Murray, whose property it is. Papaitonga, also known as Waiwiri, is a lake of about 100 acres in extent, containing two islands. It is situated about three miles to the south of Lake Horowhenua, and is, like that lake, shallow over the greater part of its area, and is drained by a winding creek flowing through low-lying land to the sea. On the northern side there is some tall forest, growing to the water's edge, and the reservation of this native woodland and the light bush on the two islands tends to invest the place with something of the ancient mysterious loveliness of a lake sanctuary. Sir Walter Buller's Bird Sanctuary. The Papaitonga estate was formerly the property of the late Sir Walter Buller, author of “The Birds of New Zealand.” He made the lake and its shores a sanctuary for native birds, and in his day bird life was very abundant on the quiet waters, where (except on very rare occasions) never a gun was heard. There is a Maori village, a small Kainga called Muhonoa, about half a mile from the lake on the seaward side. The few inhabitants are of the Ngati-Raukawa Tribe. Among the olden folk the lake was celebrated for the exceeding abundance of its waterfowl life and the other foods, such as eels and kakahi or fresh-water shellfish. Also, it was renowned for its beauty; the Maori, for all his practical side, could appreciate the poetry and the hallowed air of this glimmering water-sheet hidden in the forest, with the ferntrees bending over its bays and the raupo gently swishing in the breeze. The shores and islands of this “Beauty of the South” were a debatable land a little over a century ago, the scenes of battles between the musket-armed Ngati-Toa and other invaders from the North . Sir George Grey Lured by the Lake. Here comes in the story of the hilly wooded island which is the most conspicuous object in the landscape, opposite the old homestead and the boathouse. 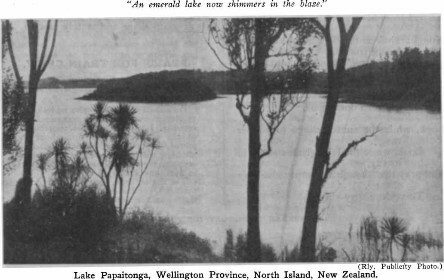 Sir George Grey, who had a curiously strong desire to buy a New Zealand island for a home, once endeavoured to purchase Papaitonga and its surroundings, attracted by the beauty of the lake and island. He had tried to purchase Kapiti Island, but without success, and also Mokoia Island, in Lake Rotorua. Eventually he bought Kawau Island, in the Hauraki Gulf. After Grey's time several Governors, and others, negotiated for Papaitonga in vain. In 1891 Dr. Buller acquired the property, about 1,300 acres, and here he made his home in a delightful sylvan solitude. Sitting here on this thrice-tapu island, with a Ngati-Raukawa companion from the little village of Muhunoa, a mile or so away, one heard some thrilling tales of Papaitonga's past. Papaitonga, like Horowhenua, and in fact all this country from Paekakariki to Manawatu and Rangitikei, was owned by the Muaupoko and Rangitane, and some kindred tribes. The Muaupoko had a stronghold on this islet; a stockade, or tuwatawata, encircled it. There were many canoes on the lake; when danger threatened, the people withdrew to the island, taking all their dugouts with them. It was in the year 1823 that Rauparaha and his Ngati-Toa and Ngati-Awa warriors invaded and captured Papaitonga. Muaupoko brought their fate on themselves, to a certain extent, by a massacre in the vicinity; but the wily Rauparaha had intended to take the place anyway, so the murders only brought matters to a head a little quicker. One of the Muaupoko's prominent chief's was Toheriri; another was Tanguru, the father of the late Major Kemp. They, or some of their fellow chiefs, invited Rauparaha and his friends to a meeting at a place called Te Wi, near Papaitonga, promising him some of the canoes on the lake, and a great feast of eels. The Ngati-Toa came, but after they had had those eels they were attacked in the night-time by their hosts. Rauparaha's daughter, Te Uira (“The Lightning”) was killed, and he himself narrowly escaped from the fatal guesthouse in the darkness. Muaupoko paid very dearly for their deed. The Maori story goes that this island pa was taken by the invaders in a daring manner. The Ngati-Toa swam across—not finding any canoes—and stormed the pa with ferocious savagery. One of the warriors, Te Tipi, won fame by firing his double-barrelled flint musket as he swam from the mainland. Foes who could fire their guns whilst swimming were too much for the nerves of Muaupoko. The islanders had no guns and they fell, and there were some grim deeds of blood on this little island that day of long ago. There is another island in the lake, much smaller but not less beautiful. It lies near the western side of the Trembling Waters. Its soil is almost level with the waters of the lake. It is but a dot of an isle, and so thickly grown with karaka trees, ti or cabbage-tree, tall flax and ferns, that it seems a tree-grove resting on the shimmering surface of the lake. We can take a boat up through the fringing flax bushes and explore the silent sanctuary. This islet is called Papawharangi. Like some of the islands in Lake Horowhenua, it is of artificial origin. It was built by the Muaupoko people in the ancient days as a place of refuge. First of all, poles were driven into the shallow lake bottom to define the extent and shape of the proposed island pa. Then masses of niggerhead bulrushes, with the earth attaching to their roots, were brought from the shore and thrown inside the pole line, and this was continued until a mound was formed level with the water. Next great quantities of kakahi shellfish were brought in canoes and deposited there, and after this many canoe-loads of soil, dry fern, and other material, until dry land was formed. Then at last huts were built and a stockade was made all round the islet. Originally, the Maoris say, Papa-wharangi was much larger than it is to-day. When Mr. Reeves visited the place, Papaitonga was a tapu place for bird life, and it was a pretty sight to watch the duck and teal and the dabchicks sail about the quiet waters in security. In the shooting season duck congregated here in thousands, for refuge. The white swan was here, too, filling in the picture with its graceful shape and stately motion.